Welcome to the Christmas Tour Kick-Off here a Mommacan.com Christmas is my favorite time of year. I enjoy decorating and having company when time allows. 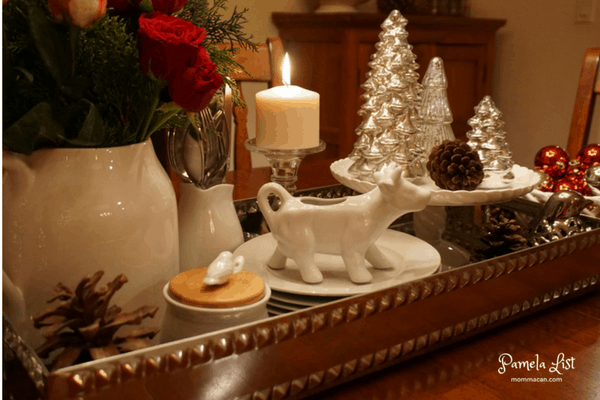 I love the sparkle of lights, the low glimmer of candles, the shimmer of mercury glass and the crisp reds and greens of a traditional Christmas. Reds and Greens seem always to spark a bit of joy in my heart because it reminds me of my momma’s house in Tennesse. These days she decorates with lots of silver and whites, but I am still a traditionalist and LOVE Pine Green and Christmas Red. Let’s begin! I found this sign and knew it belonged right here by the doorbell. I had orignally placed it in an old pine chair and had it dressed up with flowers and such, but it just seemed to fit better here as a welcome. 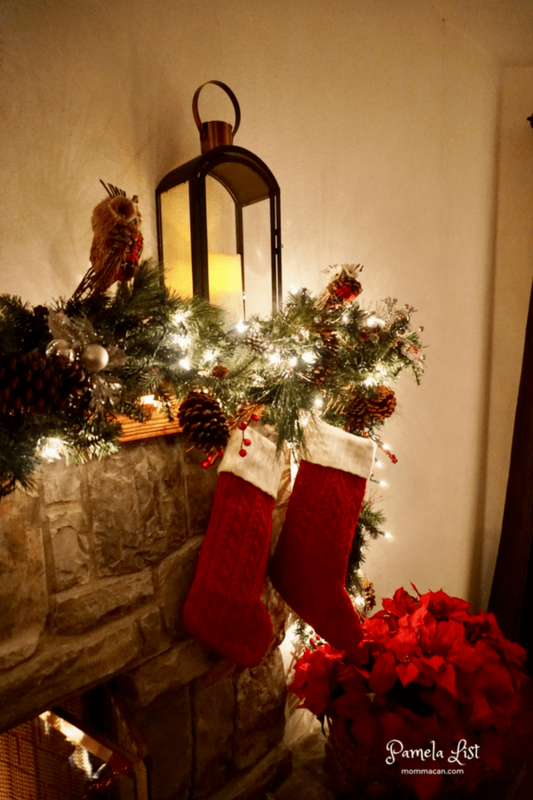 Our living room is super cozy, the Christmas tree sits in the front window and offers tons of cheerful lights, which are quite lovely at night when you drive by; we are adding outdoor lights this week! I simply love white lights at Christmas; it just brings the night sky to our home and what is not to like about that? 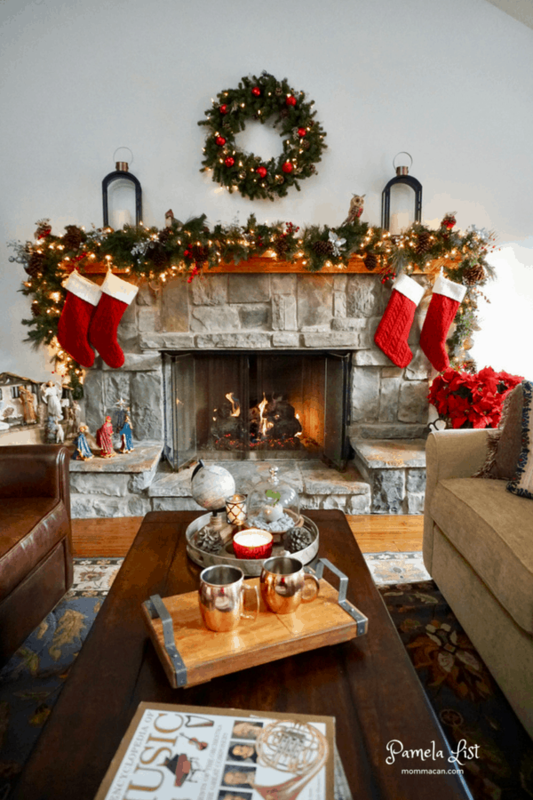 Here you can see the fireplace dressed up with lots of garlands and red stockings. I have enjoy sipping a hot cup of coffee and enjoying the morning sunshine in this room. 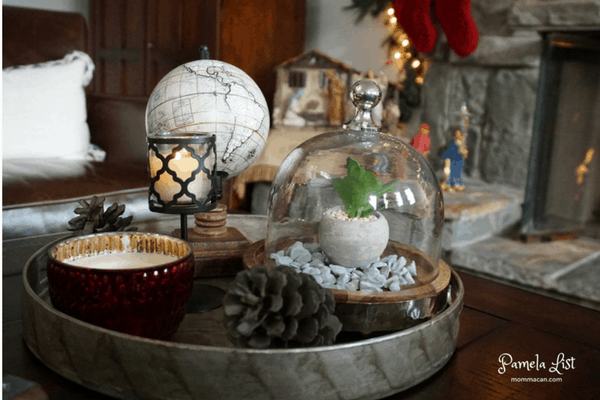 Here is a close up of a simple winter vignette, a cream toned globe and bronze pinecones help give it a timeless feel, while the red mercury candle reminds us of the upcoming festivities. Here is the dining room! 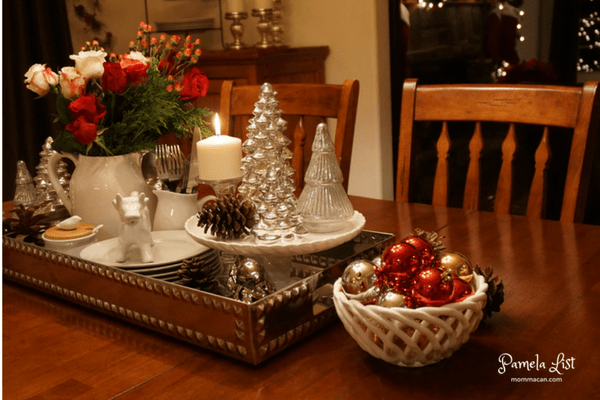 We use this table for foodservice and set up tables in the living room for Christmas. I decided to use my table decor in a sparkly vignette display until it is time to get the guest tables ready. I love the bowl of ornaments and that silly cow creamer. Here is a close up of the cow. The whole world had these for ages, and I just got mine because my youngest son insisted we needed one. Okay, so I have a confession. I also am just in love with the mercury Christmas trees and just kept taking photo after photo. But look at the contrast of the sparkly glass and the natural pinecone, so pretty. The last one, I promise, but the cow is looking over and saying HELLO! This precious tree is in memory of my brother Michael. There is an old saying that when you see a cardinal, it is a passed loved one come visiting or something like that. Seeing all of these birds each morning is a beautiful reminder of all the good times I had with my brother. I hope he is looking down on me and enjoying the crazy things that happen when a blogger does one of these tours! *note* Behind the camera is chaos I will share it with you all some time. I went with super simple on this side cabinet in the dining room. There is nothing more comforting than a bowl of crisp apples. There is a line in the book Little Women by Louisa Alcott where Jo is sitting up in the room reading and eating a bowl of russets. Evey time I see a bowl of apples it reminds me of my favorite childhood series. I read them all, and really should read them again, maybe they will make me feel more youthful! Here! answered a husky voice from above, and, running up, Meg found her sister eating apples and crying over the HEIR OFREDCLYFFE, wrapped up in a comforter on an old three-legged sofa by the sunny window. This was Jo’s favorite refuge, and here she loved to retire with half a dozen russets and a nice book, to enjoy the quiet and the society of a pet rat who lived near by and didn’tmind her a particle. As Meg appeared, Scrabble whisked into his hole. Jo shook the tears off her cheeks and waited to hear the news. My kitchen is a baking haven during the first part of December. 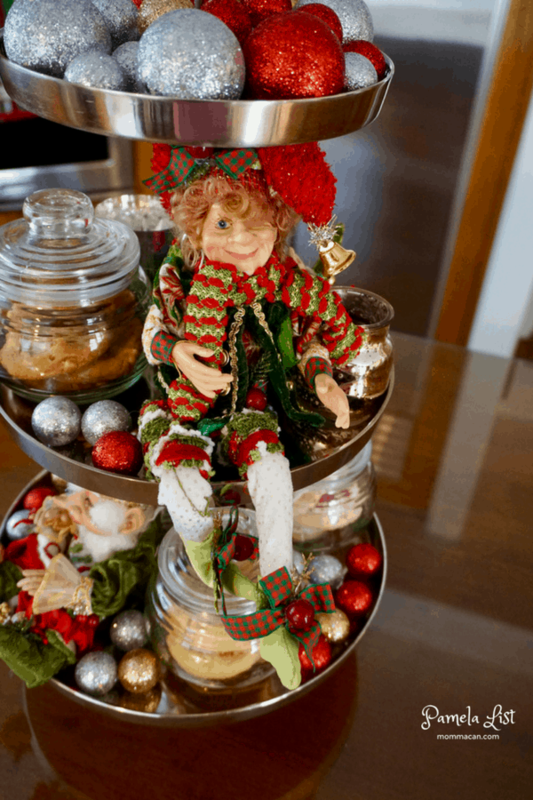 But these adorable little Christmas Fairy men look quite charming as they guard the cookies from sneaky tweens who are up past their bed time! These are Mark Roberts Christmas Fairies . Here is the Living Room Christmas tree in the evening. I love the sparkly reflecion in the window. The Dogwood is a tree of my youth. There was nothing more beautful than the white blooms in the cool, crisp early spring mornings. It was also the year Elvis Presley died. We had only been living in Memphis for a few months when it happened. I remember when the ladies in the neighborhood gathered around discussing the sad news, it was as if we had lost a President. Elvis was a huge contributor to the community and of course the King of Rock and Roll. Each Christmas he decorated Graceland with the largest manger scene I have ever scene. He loved music, his family, and he really loved his “King”. 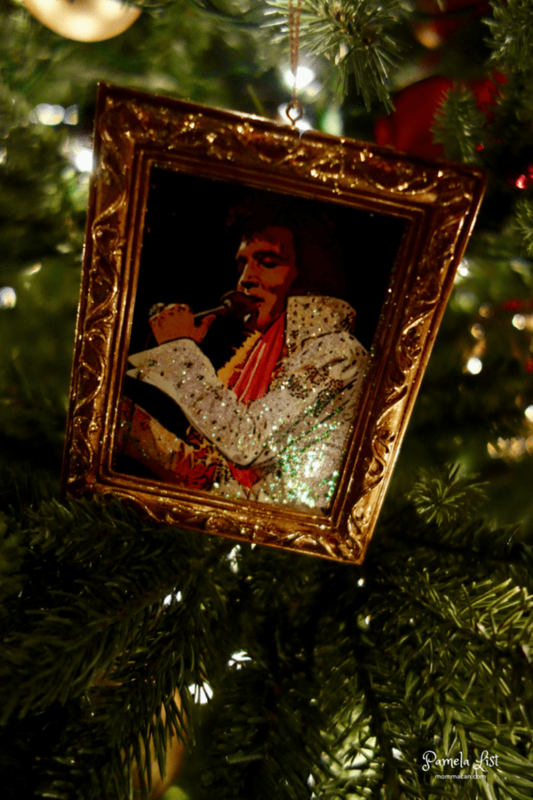 You can see a photo of Christmas at Graceland here. I had other plans for the mantle this year (really wanted to go with a grand New Orleans theme), but for some reason I ran with this bird theme and then I thought, lanterns really are a representation of lighting the way. So I hope when folks see the lights in the window, they have just a little whisper of hope bending their ear, and of the beautiful spirit of Christmas. 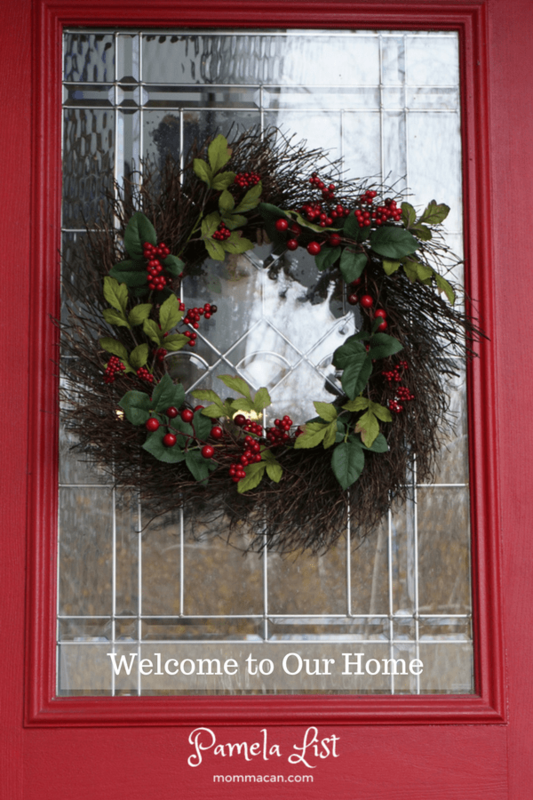 I hope you enjoyed peeking in our California home for a brief Christmas Tour. 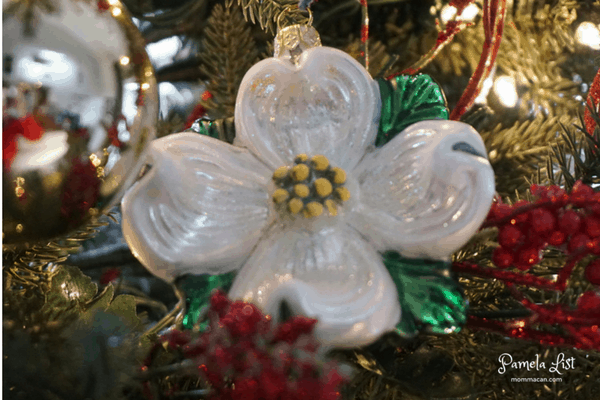 Christmas is wonderful to me, it is an excuse to add several bits of my Southern heritage throughout the home. I hope to share some of my kitchen and bedroom later this month, but time will tell. Like all of you, I am super busy, so don’t wont to pinky promise. I hope you have a beautful Christmas! And remember your best Sparkle is the sparkle in your eye when you laugh with family and friends. Your home and Christmas decorations are gorgeous!!!! Your mantle is so beautiful and puts my little one to shame, lol!! My mother-in-law also recites that saying about cardinals and she knows it is my father-in-law coming back to check on her 🙂 Have a very Merry Christmas my friend!! Pam, your home decorations are beautiful and the mantle is perfect. 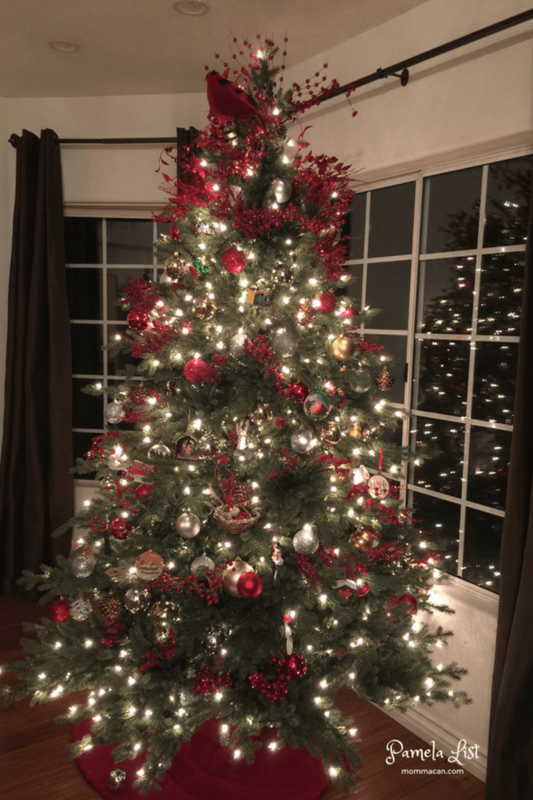 I like the Christmas tree, is majestic, I am sure it is one of those that when strolling outside you will stare at the beautiful tree behind the window! Have a wonderful Christmas! 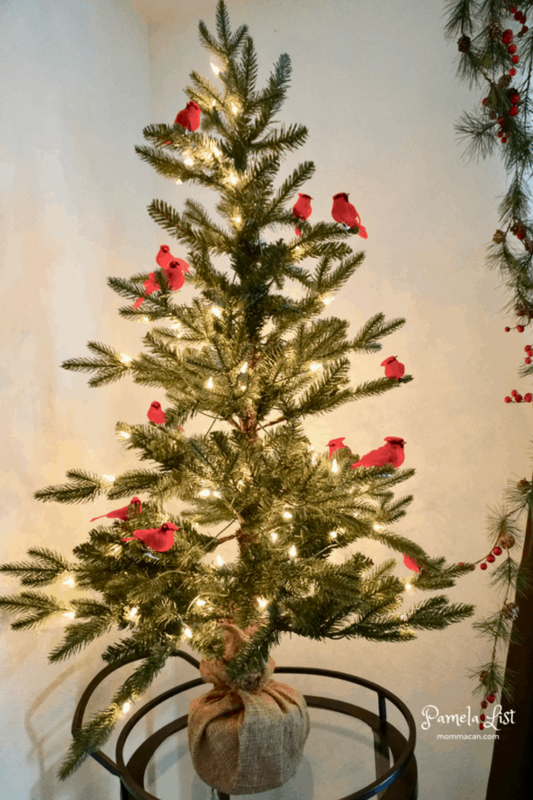 I had no idea about the cardinals but your tree looks just like the photo you posted yesterday! What a lovely Christmas home. The mantle is magnificent! I love the lighted garland. Every little spot is so intriguing and beautiful. 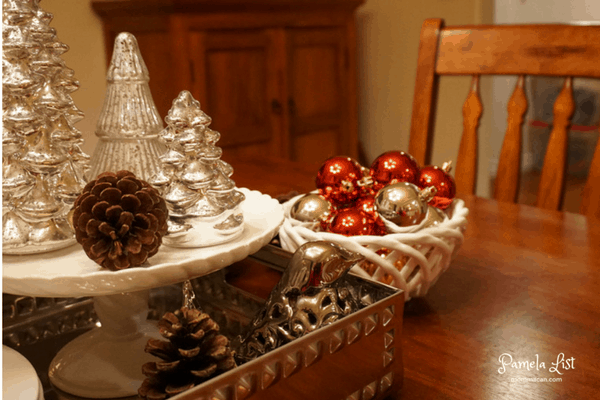 Your table ware as decor is such a great idea. I am totally a lover of ornaments and love that you shared a few special ones. Thanks for opening your home! Your home is gorgeous, personal, tells a story. Little Woman is one of my all time favorite movies. The cardinal tree is breathtaking, I am certain your brother Michael is feeling your love and shaking his head at all the antics of putting this blog hop together. It certainly was worth the effort you put in Pam. I feel warm and content reading it. That tree in the front window will certainly bring smiles to everyone who wanders by. Pam I love what you have done. Your little men protecting the cookies are gorgeous (maybe that’s what I need to protect our cookies, LOL). Beautiful fireplace with the figurines at the bottom. So many lovely things to look at. Anyone walking by would love looking at your tree. Thank you for sharing. Hi Pam your home is beautiful! The fireplace looks so cozy and inviting for a visit, and your welcome sign is just great, would love to have something like that as well! And the cow creamer just got added to my Christmas wish list, I think it is perfect. I thoroughly enjoyed your tour. I never knew that about the cardinals but now when I see one in the backyard I will know it is my parents or other loved ones. Your house looks wonderful and I love the traditional green and red. 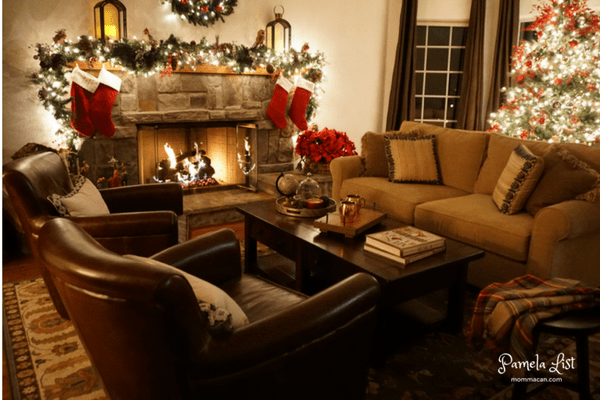 Pam – your living room IS wonderfully cozy! And I especially like your rock fireplace-surround, mantle and hearth. The mantle is beautiful, and your tree is so perfect in that spot. I, for one, love to see Christmas trees in windows! I laughed out loud when I saw your cow creamer. I have one too, AND I have a little baby cow, sitting on it’s haunches. I totally get it – they are so cool! I feel like you not only opened your home, but you opened your heart to us as well, sharing about your brother. 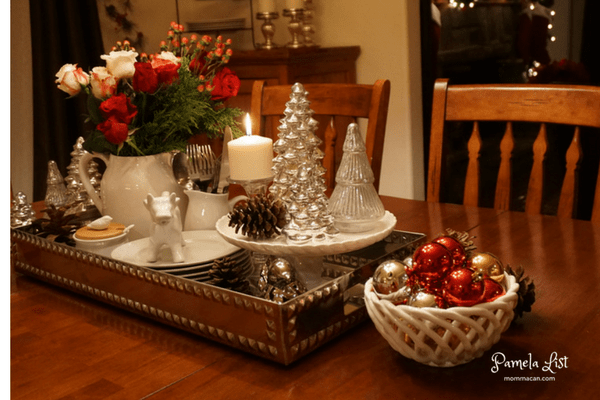 I am going to steal your idea of staging the dining room table with a tray vignette! Best wishes to you and your family for a wonderful Christmas! Pam, your home is gorgeous! I love the evening photos when the lights are twinkling and making your rooms look magical! Thank you for inviting us into your home- hope you feel better soon! 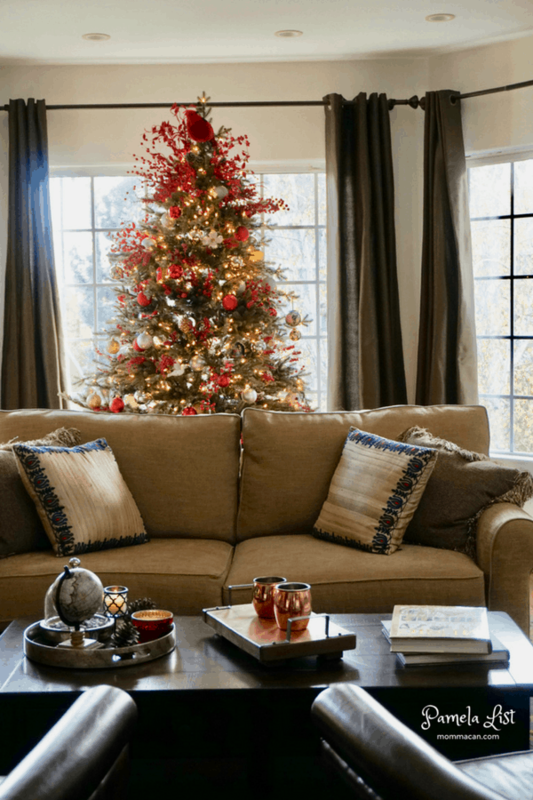 I so love the story your home at Christmas tells. The birds, especially the cardinals are very special. I have cardinals on my stairwell, along with dragonflies in honor of my dad. I love the elves that protect the cookies. My daughter is getting that same cow for Christmas this year. He is awesome!! I think I will come over and park myself in your living room with a cup of coffee. It is so cozy!! Thank you for inviting me to visit your beautiful home. 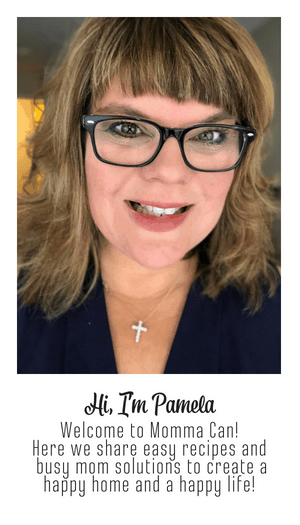 Pam – Your home is so inviting! 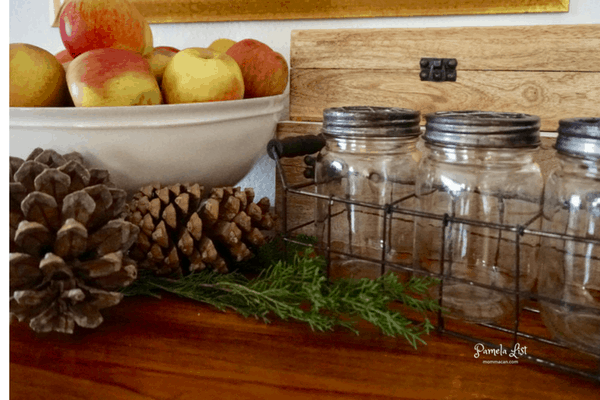 You have such beautiful details in your vignettes but have a warmth in all of the decor. I would love to sit by your fireplace and drink some hot cocoa while admiring your decorations! 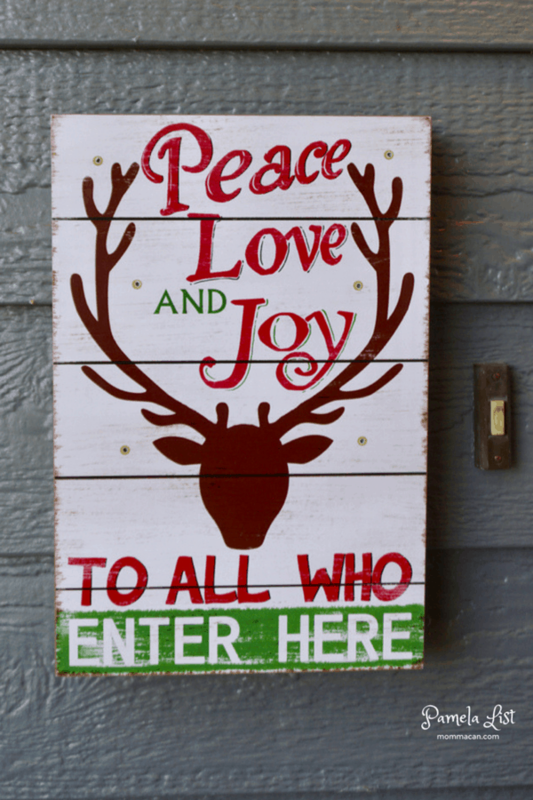 Thank you for inviting me into your home this holiday season! I enjoyed the tour. Very pretty indeed! Everything looks so beautiful and cozy. That mantle fireplace is the star of the show. I love all the lights and totally agree that the lights are make the decor magical. 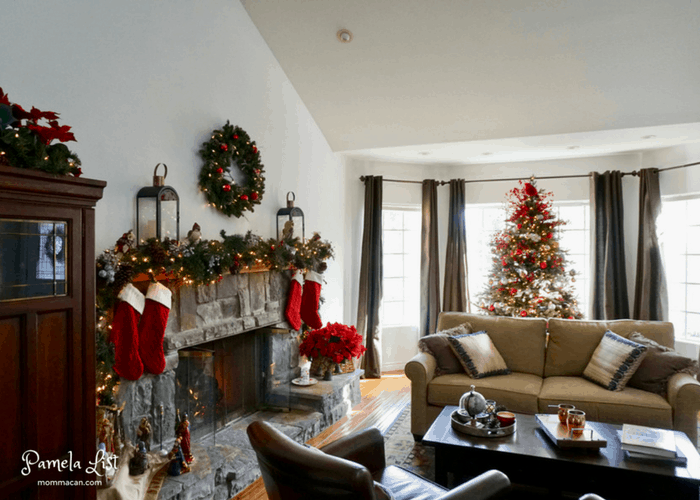 I find it funny that you get a second round of decorating – I was thinking of changing up a few things myself! !